A few weeks ago I made the Bacon version of this dish. Today I had some cubed ham and Mexican cheese and decided we'd try that instead of bacon/cheddar. It worked out very nicely. Heat oven to 350 degrees. Spray a 11 x 7 or 12 x 8 glass baking dish with cooking spray. In a large bowl, beat egg and milk with a wire whisk until smooth. Separate dough into individual biscuits and cut each biscuit into quarters. Gently stir biscuit pieces into egg mixture to coat evenly. 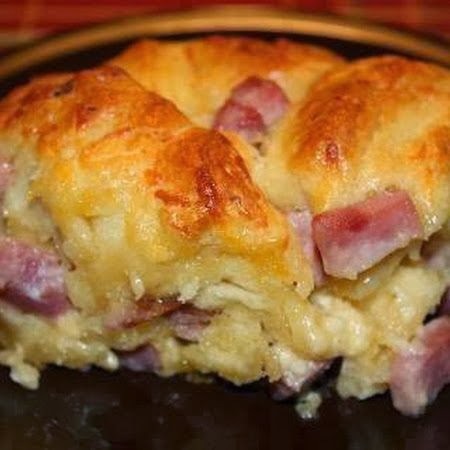 Fold in ham, cheese, onions and granulated garlic. Spoon mixture into prepared dish, arrange biscuit pieces in a single layer. Baked at 350 for 23 - 25 minutes or until golden brown. You can either cut into squares or just pull apart and serve.